Where can I find information about library input for the various HiSeq chemistries? For information on library library input for the various HiSeq chemistries, see the HiSeq Systems Denature and Dilute Libraries Guide. How much time does a standard HiSeq 2500 run take? See system specifications on the HiSeq 2500 Specifications page. Which systems are capable of running HiSeq Rapid v2 chemistry? 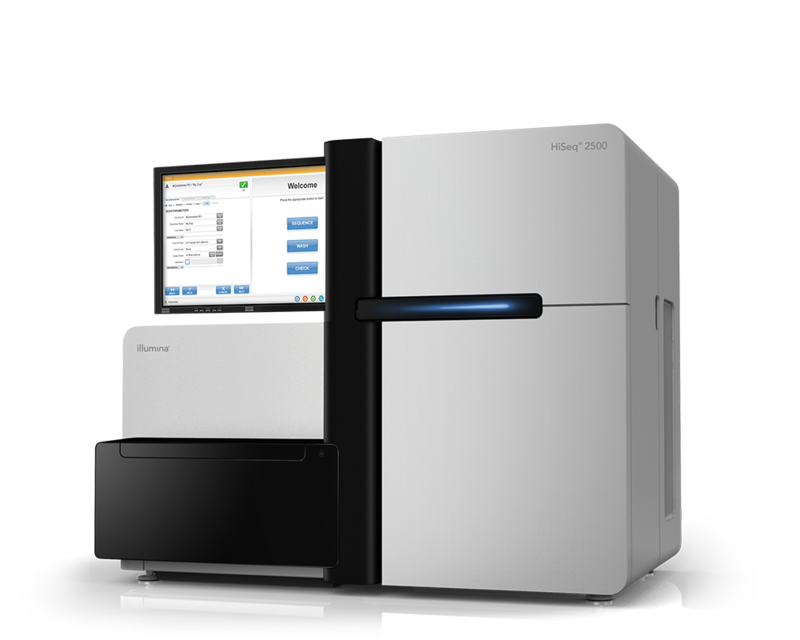 The HiSeq 2500 and HiSeq 1500 Systems have Rapid Run mode and can run HiSeq Rapid Run v2 chemistry. Which systems are eligible for the HiSeq v4 upgrade? For more information, see the upgrade resources on the Documentation page for your instrument. Are TruSeq Custom Amplicon, TruSeq Amplicon Cancer Panel, and Nextera XT applications supported to run on the HiSeq? All validated Illumina library prep methods are supported to run on the HiSeq. However, make sure that you match samples with the desired output to maximize workflow efficiency. Can I process a sample with low sequence diversity? Real-Time Analysis (RTA) v1.18 includes optimizations to the algorithms that identify clusters and estimate the color normalization matrix and phasing and prephasing rates. These optimizations improve the ability of Real-Time Analysis to handle low-diversity samples, such as samples with unbalanced genome compositions (AT- or GC-rich genomes) or samples with low sequence diversity (amplicon sequencing). Because of these improvements, it is no longer necessary to designate a control lane in the control software to estimate matrix and phasing. For details, see Low-Diversity Sequencing on the Illumina HiSeq Platform. How many cycles of sequencing are possible with SBS kits? The 250-cycle kit contains enough reagents for 275 cycles. The 50-cycle kit contains enough reagents for 75 cycles. The 200-cycle kit contains reagents for 209 total cycles. The 50-cycle kit contains reagents for 58 total cycles. The 500-cycle kit contains reagents for 525 total cycles. The 200-cycle kit contains reagents for 225 total cycles. The 50-cycle kit contains reagents for 74 total cycles. Can rapid run SBS reagents and high output SBS reagents be combined? No. Rapid run SBS reagents and high output SBS reagents cannot be combined. Each set of reagents has been formulated specifically for use only with its respective flow cell and instrument run parameters. The cluster kits and flow cells are also paired with respective kit types and cannot be combined. Can I combine HiSeq SBS v4 kits to achieve read lengths longer than what is provided in a kit? Yes. See “Preparing SBS Reagents” in the HiSeq 2500 and HiSeq 1500 system guides for a list of how many SBS kits can be combined for supported run lengths. What are the catalog numbers for the HiSeq Rapid v2 reagent kits? Can HiSeq SBS v4 and TruSeq SBS v3-HS reagents be combined? No. HiSeq SBS v4 and TruSeq SBS v3-HS reagents cannot be combined. Each set of reagents has been formulated specifically for use only with its respective flow cell and instrument run parameters. The cluster kits and flow cells are also paired with respective kit types and cannot be used interchangeably. Can HiSeq Rapid SBS v2 and TruSeq Rapid SBS reagents be combined? No. HiSeq Rapid SBS v2 and TruSeq Rapid SBS reagents cannot be combined. Each set of reagents has been formulated specifically for use only with its respective flow cell and instrument run parameters. The cluster kits and flow cells are also paired with respective kit types and cannot be used interchangeably. Can I use different sequencing primers in the two rapid flow cell lanes? No. The same sequencing primer is distributed across both lanes of a rapid flow cell as part of the HiSeq 2500 on-instrument cluster generation workflow. Which flow cell can I use to perform an instrument wash on my HiSeq system? Any used flow cell that has been properly stored in buffer can be used for the instrument wash. Using the flow cell from a recently completed run to perform post-run and maintenance washes is often easiest. Both v3 and v4 flow cells can be used to wash after high output modes. After Rapid Run mode, both HiSeq v2 and TruSeq flow cells can be used. Will TruSeq v3 reagents continue to be sold? Yes. There are currently no plans to discontinue the sale of TruSeq v3 kits. When using HiSeq v4 reagents, do you have to change reagents during the run as with TruSeq v3 reagents? HiSeq v4 kits are designed for a walk-away workflow, so all reagents are loaded before the run is started. Splitting incorporation buffer for Read 2 is not necessary. Is the incorporation reagent supposed to be a different color? Yes. The incorporation reagent included in the HiSeq SBS Kit v4 appears more blue than the purple shade of the incorporation reagents included in the TruSeq SBS Kit v3. How long can a rapid flow cell be stored after finishing template hybridization and first extension on the cBot 2 System and before being run on the HiSeq 2500 System? You can store the rapid flow cell up to 24 hours after template hybridization and first extension. However, Illumina recommends that you start the sequencing run on the same day. Are there any special requirements for the master-mixed HiSeq SBS Kit v4 incorporation reagent? Store the reagent at the recommended temperature labeled on the box and protect the reagent from natural and fluorescent light. How long can rapid SBS reagents be stored after initial preparation? Prepare rapid SBS reagents the night before or on the same day of use only. Do not store reagents longer than overnight. For use on the same day, store prepared reagents on ice in the original bottle with the cap tightened. For use the next day, store prepared reagents at 2°C to 8°C overnight. Can TruSeq v3 reagents be used on a system that has been upgraded for HiSeq v4? Yes. You can continue to use TruSeq v3 reagents as well as HiSeq v4 reagents. The chemistry type is specified when you select the mode before starting the run. Why are the polymerase and FFNs missing from the HiSeq SBS Kit v4? The HiSeq v4 chemistry includes a pre-mixed incorporation reagent similar to the TruSeq Rapid kit. Does a HiSeq 1500 or HiSeq 2000 need to be upgraded to a HiSeq 2500 to run the HiSeq v4 chemistry? No. All eligible HiSeq 1500 and HiSeq 2000 systems only need the FPGA and software upgrades to use the HiSeq v4 reagents. How long can maintenance wash solution be stored after initial preparation? Maintenance wash solution can be stored for up to 30 days at room temperature. In that 30-day period, the solution can be used up to three times. For the first use, assign each bottle and tube to a reagent rack position. Maintain those positions for the second and third uses to prevent cross-contamination. How long can HiSeq v4 reagents be stored after initial preparation? Prepare HiSeq SBS Kit v4 reagents the night before or on the same day of use only. Do not store prepared reagents longer than overnight. For use on the same day, store prepared reagents on ice in the original bottle with the cap tightened. For use the next day, store prepared reagents at 2°C to 8°C overnight. Do I need a cBot System to run sequencing v4 flow cells on my HiSeq System? Yes, a cBot System is needed for cluster generation on any 8-lane high output flow cell, including HiSeq v4 and TruSeq v3. How long does the resynthesis step take on a HiSeq System? The resynthesis step takes approximately 3 hours. Why is there more volume in my sample tube at the end of my rapid run than when I started? At the end of all rapid sequencing runs, the instrument flushes water back into the sample tube to clean out the lines and prevent drying. This flush is an automatic procedure and does not require user intervention. This procedure dilutes sample left in the tube. Therefore, any sample left in the tube should be discarded after the run. Is there a rehyb protocol available for HiSeq v4 runs? Yes. Primer rehybridization for HiSeq v4 runs can rehyb the Read 1 primer, the Index 1 Read primer, or the Read 2 primer. Rehyb runs are performed on the HiSeq. For more information, see the HiSeq High Output Primer Rehybridization Reference Guide (part # 15050105). Can I switch modes on only one side of my HiSeq system? A single side of the instrument can be switched from one mode to the other. However, after a run begins on one side, a run cannot be started on the other side unless it is the same mode. Perform mode-switching procedures on the side that you intend to sequence on in the new mode. For example, if you have completed two rapid runs on side A and B, and want to set up only one high output flow cell on side A, change the mode for only side A. A high output run on side B cannot be performed until a mode change is complete on side B. For efficiency and the most run flexibility, perform mode-switching on both sides of the system at the same time. Can I run my HiSeq System with different run modes on each side? No, only runs of the same mode can be performed simultaneously. If you run TruSeq v3 mode on side A, then you must run TruSeq v3 mode on side B. The same is true for running HiSeq v4 mode. For Rapid Run mode, you can perform a rapid run on both sides using TruSeq Rapid kits on one side and HiSeq Rapid v2 kits on the other. Do I need to prime SBS reagents in HiSeq v4 run mode? Yes. Priming SBS reagents is required. The control software prompts for this step, which takes about 15 minutes. Do I need to prime SBS reagents in Rapid Run mode? No. Priming is integrated into the HCS workflow for Rapid Run mode. How long does it take to switch between modes on my HiSeq System? It takes about 45 minutes to change from a high output (HiSeq v4 or TruSeq v3) to TruSeq Rapid mode. It takes about 3 hours to change from Rapid Run to a high output mode. Time spent for mode switching is in addition to instrument washing performed at the end of each run. Where do I load the eight- and 10-port gaskets with a rapid flow cell and a high output flow cell? For setting up either a Rapid Run mode, TruSeq v3 mode, or HiSeq v4 mode on a HiSeq 2500 or HiSeq 1500 System, load the eight-port gasket in the back manifold position and the 10-port gasket in the front manifold position. For a run on a HiSeq 2000 System, load eight-port gaskets in both the front and back positions. If you are using the TruSeq Cluster Kit v3 and need 10-port gaskets for the front manifold, contact Illumina Technical Support. Where do I load my samples on the cBot if I am using the HiSeq or TruSeq Rapid Duo cBot Sample loading kit? Load 135 μl of the denatured and HT1 diluted library into wells 1 and 2 of an 8-tube strip. Then load the 8-tube strip into the cBot tube strip holder with wells 1 and 2 positioned toward the right side. How long does it take to complete a water wash and maintenance wash? A water wash and maintenance wash each take approximately 1 hour. The maintenance wash protocol has changed to consist of only one step, washing the system with Tween 20 and ProClin 300, so there is no need to return to the instrument to reload wash solution or water. How often do I need to wash my HiSeq System? A maintenance wash is required every 10 days or when switching between high output and rapid modes. A water wash is required after each rapid run. After a high output run, you can choose between a water wash or a maintenance wash. Illumina recommends a maintenance wash.
How long does the cBot System take to perform clustering on a HiSeq v4 flow cell? Clustering takes slightly more than 2 hours. Clustering on a HiSeq v4 flow cell requires the updated cBot software (v2.0.16, or later) and requires v9.0 recipes. Which systems can run the Tween 20 and ProClin 300 maintenance wash? All HiSeq systems can perform the Tween 20 and ProClin 300 maintenance wash.
What is the intensity spike after template generation? After template generation is completed with cycle 5, HiSeq v4 runs might have a noticeable increase in the reported intensity by cycle in Sequencing Analysis Viewer. This increase occurs at this point because the reported intensities include only the clusters included in the final template. Before template generation, total intensity is reported. Where is the control lane feature? The option to designate a control lane was removed from HiSeq Control Software (HCS) v2.2. The software includes optimizations that improve the handling of low-diversity libraries, which eliminates the need for a control lane for matrix and phasing estimates. How do I change the instrument health upload option? From the Welcome screen, select Menu, then Tools. The Options menu includes the checkbox to turn on or off instrument health data. Select View Terms for more information about the instrument health option. Is HCS v2.2 available for non-upgradeable systems? How large is the run folder? Saving the standard set of files without thumbnails results in a run folder that is approximately 200–500 GB. If standard thumbnails are saved, approximately an additional 300 GB is required. Approximately 1 TB is storage used by the alignment folder and related folders. I received a warning message that I need at least 750 GB space in the local server when starting a run. Is the run folder on the local computer 750 GB? 750 GB is required at the beginning of a run. The system assumes that data are transferred to the network copy of the run folder in real time. Therefore, 750 GB is the safe level to start a run. The software assumes that the run copies and deletes the files as they are processed, and that the connection to the network server can keep up with file transfer. Can I analyze v4 data with CASAVA? If you currently use CASAVA, you can analyze HiSeq v4 data with CASAVA. You need to use the bcl2fastq v1.8.4 conversion software in place of the configureBclToFastq component of CASAVA. For HiSeq v4 runs, perform alignment of data from each separately, and then merge the data at the configureBuild step. Can I analyze rapid run data with CASAVA? If you are using CASAVA, you can analyze rapid run data with CASAVA. If the zip BCL files option was chosen during run set up, you will need to use the bcl2fastq converter in place of the configureBclToFastq component of CASAVA. For rapid runs, you will align data from each flow cell separately and then merge the data at the configureBuild step. How many swaths and tiles are on an 8-lane high output flow cell? Scanning and analysis of a high output flow cell is performed in three swaths per surface on two surfaces per lane. Each swath is divided into 16 tiles. An 8-lane flow cell contains 768 tiles per flow cell. How many swaths and tiles are on a 2-lane rapid run flow cell? Scanning and analysis of a 2-lane rapid run flow cell creates two swaths per surface on two surfaces per lane. Each swath is divided into 16 tiles. For a 2-lane flow cell, there are a total of 128 tiles per flow cell. How do I format my sample sheet? When using BaseSpace, sample sheet format can follow either HiSeq Analysis format or CASAVA format. For runs that require demultiplexing with either bcl2fastq 1.8.4 or CASAVA, a CASAVA-formatted sample sheet is required. This format is described in the bcl2fastq 1.8.4 User Guide (part # 15038058) and the CASAVA User Guide (part # 15011196). Sample sheets for rapid runs include information for two lanes, as compared to eight lanes included in a sample sheet for a high output run. Sample sheets for rapid runs can be generated manually, using Excel or a text editor. If you are using BaseSpace for data storage and analysis, a sample sheet is required for both rapid runs and high output runs. If using BaseSpace only for run monitoring and you are not indexing, a sample sheet is not required. If I send my data to BaseSpace Sequence Hub, what analysis options do I have? You can use BaseSpace Apps to analyze data in BaseSpace Sequence Hub. Select the Apps tab in BaseSpace Sequence Hub to see available apps and descriptions.